When Oliver! was first produced as a musical, in 1963, it must have seemed paradoxical. The Charles Dickens novel, Oliver Twist is a typically dark portrait of the conditions in England for the poor, compounded by the impact on small children. Lionel Bart, who wrote the book, music and lyrics, found a way to combine the tawdry and dispiriting world of the poor in London in the 1830s with enough hope and goodness to have theatergoers leave feeling uplifted. Director Rob Ruggiero has done the same thing with this production of Oliver! now at Goodspeed Musicals through Sept. 13. Perhaps you have forgotten or never knew the basic plot of the show. Oliver Twist is a young orphan who escapes from a workhouse where food was scarce and love non-existent, into an underworld of pickpockets and worse. But he finds a kind of acceptance from the other boys, the leader, Fagin, and the “head boy,” the artful dodger. He also finds a mother substitute in Nancy, who loves the ruthless Bill Sikes. Oliver’s first attempt at crime goes all wrong yet Mr. Brownlow, a well-to-do gentleman, takes him home. But he is not yet destined for a happy ending. With Fagin and Bill Sikes afraid that Oliver will reveal too much about their activities, they kidnap him and bring back to the group. Yet all ends well, or almost so. Oliver is reunited with Brownlow to anticipate a much happier life. The novel, which as many Dickens novels were, was actually a newspaper serial, has multiple complications to keep buyers anxiously awaiting the next installment. The musical’s book has been streamlined, removing many of the harrowing events that befall Oliver. Also needed are excellent actors in the roles of Fagin, Dodger, Nancy and Bill Sikes. Again, this production mostly succeeds. 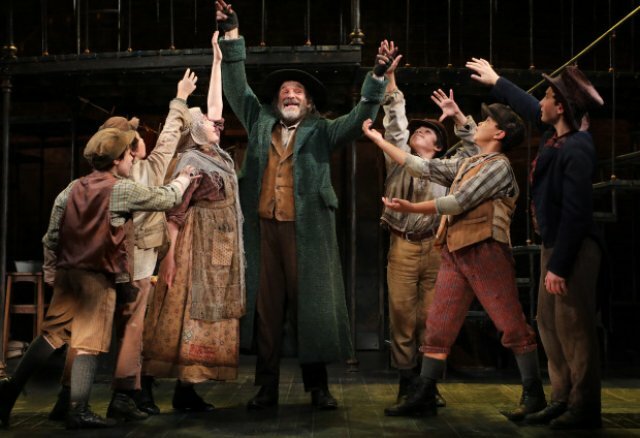 Donald Corren absolutely rules the stage as Fagin in all of his numbers but particularly in “Reviewing the Situation.” He is truly the star of the show. Gavin Swartz displays really talent and charm as Dodger, the leader of the gang of pickpockets and a sort of protector of Oliver. The villain of the play, besides the officials who enforce the horrendous laws governing poor orphans and other poverty people, is Bill Sikes. He is a cruel, almost sadistic killer who has no sympathy or love for anyone, including Nancy. Brandon Andrus doesn’t try to humanize him; he is the epitome of pure evil. He also doesn’t try to make him so over-the-top that he is a caricature; instead he exudes evil through every pore. He may only have one song, “My Name” but his deep baritone makes the most of it. EJ Zimmerman is less successful as Nancy. She is a complex figure: she is a “graduate” of Fagin’s “school,” she still leads a criminal life, she loves (and fears) the abusive Sikes, but Oliver brings out her maternal instincts. Zimmerman is very good, but misses excellence. She’s great in the ensemble numbers – “It’s a Fine Life,” “I’d Do Anything,” and the music hall “Oom-Pah-Pah.” Where she comes up short for me is her first rendition of “As Long as He Needs Me,” the torch song that explains her feelings for Sikes. In that first rendition, she sounds more angry than regretful. In the second act reprise, she conveys the emotions more effectively. Ruggiero has gathered a talented cast of actors for the smaller roles and directed them so effectively that each creates a wonderful moment or two. James Young as Mr. Brownlow shows us the caring and forgiving side of the world. He is almost the only one. Young creates a character that is both reserved but loving; he too recognizes Oliver’s goodness. Richard R. Henry and Joy Hermalyn are both funny and disgusting as Mr. Bumble the beadle of the work house and the widow of the workhouse, who has her eyes on him. Jamie LaVerdiere is terrific as Mr. Sowerberry, the owner of the funeral home who “buys” Oliver to serve as a mute mourner at the funeral of children. As usual with Goodspeed productions, all of the production elements are top notch from the scenic design by Michael Schweikardt, the lighting by John Lasiter, sound by Jay Hilton and the costumers bv Alejo Vietti though those may seem a bit too nice for the level of poverty. James Gray has infused the show with expressive choreography that makes the most of the small stage. Certainly, Ruggiero has brought out all of these elements in his vision of the show especially the desire for community, home and a sense of belonging. I had just one quibble with his direction. Fagin, the paterfamilias of the gang of pickpockets, has always been controversial. In the original novel, he is Jewish at a time when anti-Semitism was prevalent. While on stage, this Fagin does nothing to promote that idea, Ruggiero does have him at times followed upstage by a violinist, recalling the violinist in Fiddler on the Roof. I’m not sure why made this choice but I found it both puzzling and at times distracting. Why in the middle of the slums is the fiddler suddenly appearing? Both you and children (probably eight or older) will have a very good time at Oliver!. For tickets visit Goodspeed or call 860-873-8668. Posted courtesy of Two on the Aisle.